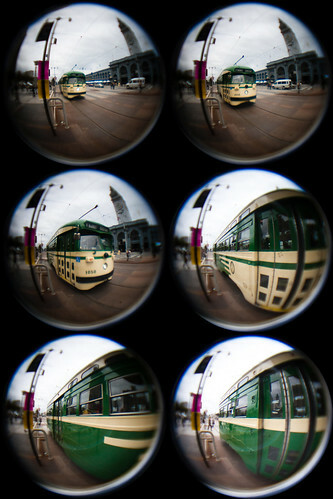 Fisheye lenses are insanely fun to shoot with. They allow you to shoot at very wide angles - wide enough lenses will get people standing right next to you into the shot. I've always loved the wide angle look in videos, and I thought it'd be an awesome exercise in redundant and needless hackery to build my own. 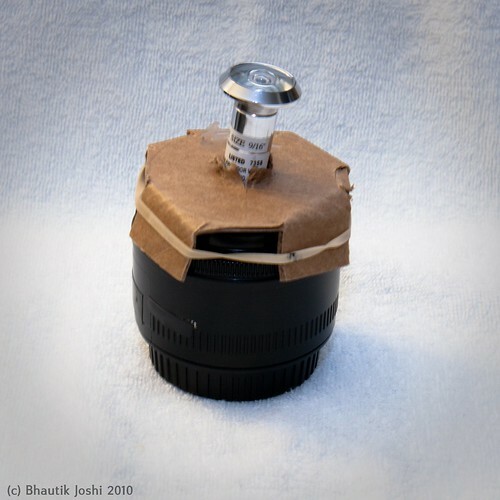 Built using a fisheye peephole as the main lens element and a decapitated soda can as the lens body (! ), this attaches directly to my SLR camera. For well under US$20, I ended up with a lens that has nearly a 180-degree field-of-view, adjustable focus, a canon EOS mount, and due to it's stylish and sleek exterior, can generate limitless amounts of admiration ridicule confusion. Unlike commonly (and cheaply) available fisheye adapters, this build does not attach to the front of an existing lens - it's a completely self-contained unit that doesn't require any other optics to work. 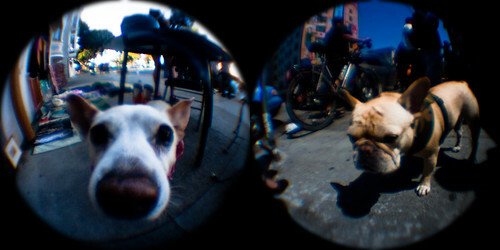 The cheapest and easiest to get fisheye lens out there at the moment is the garden variety door peephole lens. These simple optical devices can be picked up cheaply at your local hardware store. I picked up mine for US$6; it offered a huge field of view (nearly 180 degrees). As I discovered in my previous hacks, individual lenses are hard to directly transplant from one device to another. Often an intermediate lens is required to refocus the image so it hits the sensor/film correctly. The peephole lens couldn't be used directly with the SLR - like the phone-o-scope, it needed a teleconverter is needed to magnify the small image at the end of the fisheye barrel, and bring it into focus at the image sensor. 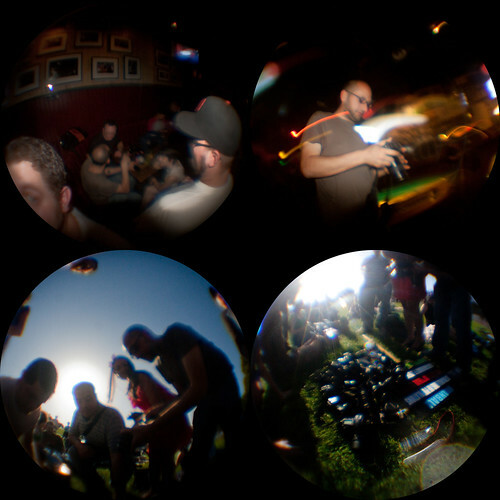 ...and while this works, I didn't like the idea of having a complex lens in-between the fisheye and the camera. Modern lenses have many internal elements, each one dimming the image coming from the fisheye and leading to low-contrast images. I wanted to build a lens that would remove the complex in-between lens and replace it with a simple one that wouldn't lose quite as much light. I needed to couple the fisheye lens with something that would magnify the image coming out of it, and space it so that it would form a good image at the sensor. Rummaging around in my parts box, I found an old, single element projector lens that came from an old 35mm slide projector. These are pretty pretty easy to find, and I've seen them a lot at garage sales. I took the body cap off my camera, and held the two lenses in front of the body. Looking through the viewfinder and experimenting with the lens positions, I was able to come up with an estimate for how far the lenses needed to be apart from each other and the camera body to make a reasonable image. Running around loosely holding lenses in front of the camera tends to be fraught with danger, however, so the next step was to build a permanent enclosure for them. The design centres around having two main components - a lower enclosure for holding the projector lens, and an upper slot for the fisheye lens. In the design, the lens attaches to the camera using a T-mount to EOS adapter. It turns out that the adapter I was using had nearly exactly the same diameter as a soda can, so I decided to use that as my lens body. To hold the projector lens firmly in place in the can, I made use of two pieces of packing foam, cut into halves of a cylindrical tube that fit around the projector lens. Since the foam I was using is not completely opaque, I also inserted a cardboard ring cut into the shape of a donut at the base of the foam cylinder to stop light leaks. 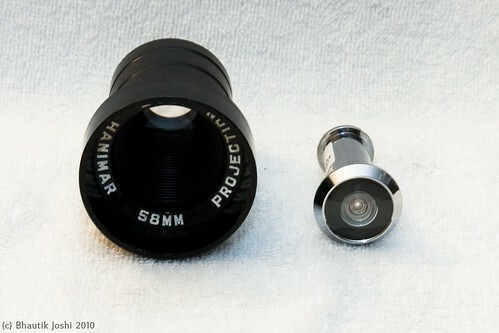 A similar principle is used to fit the fisheye lens into the projector lens mouth. Foam discs that are a little larger than the diameter of the projector lens mouth are cut out; in the centre of this a hole is made so that the fisheye lens fits snugly inside them. Another cardboard stopper is placed at the base of the foam to stop light leaks. Assembly was pretty straightforward. 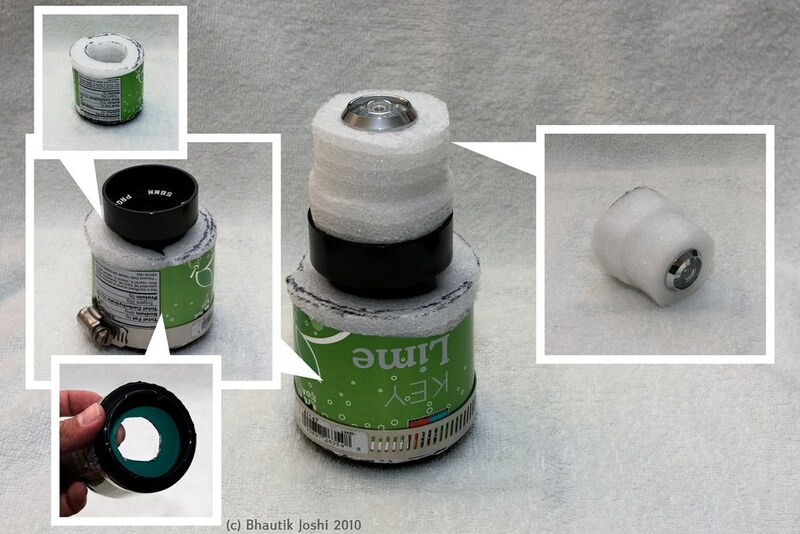 The t-mount is inserted into the can first, and the stopper ring on top of it. The foam cylinder halves are inserted next. To keep things extra secure, a plumbing clip is wrapped around the mount end of the can. 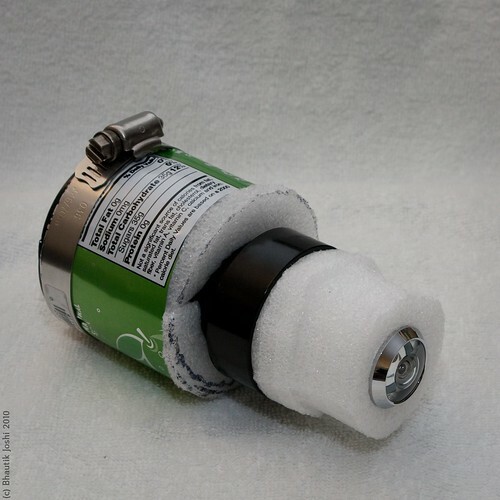 The projector lens was carefully inserted into the centre of the foam cylinder tube. The projector lens that I had has a screw-thread, so I was able easily twist it into place. This added an extra bonus - turning the projector lens unscrews it, allowing for racking the lens back and forth - which means that the lens can be adjusted for focus. Most door fisheye lenses come in two parts - a lower part which goes into the back of the door, and an upper part which screws into it from the front side of the door. Separating the lens into these two halves, the cardboard stopper is slid it on to the lower half. The foam discs are slid on next, and then the top half of the fisheye is screwed back in. This whole assembly is snugly fitted into the mouth of the projector lens, and then the build is complete! Even if your projector lens doesn't have a thread, you can still adjust the focus by turning the upper half of the fisheye lens - unscrewing it a little with lengthen the lens body, allowing you to finely focus it. 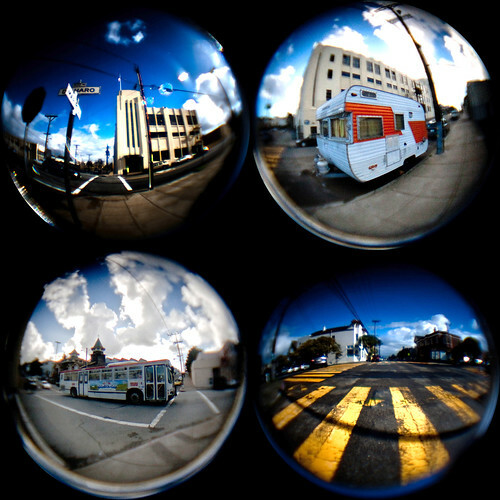 The fisheye lens is ludicrously fun to shoot with. If you can, get in close to your subject - you'll be surprised how close you can get and still have your surroundings in the frame. 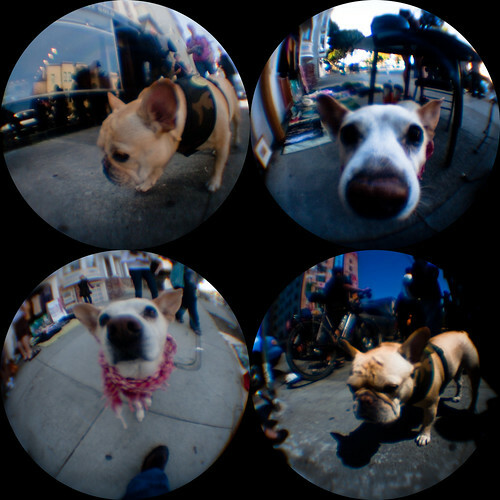 Pets are always awesome for fisheye photos, especially if they're happy to stick their nose into the lens. The lens combination makes saturated, contrasty pictures. As the results show, door fisheye lenses were never meant for even vaguely serious photography, and individual images don't stand up well to close inspection. In future revisions I think I might experiment with adding in an aperture to crank up the f-stop and perhaps reduce some of the sharpness and colour artefacts. However, if you take a few of the fisheye pictures and arrange them into a grid, you can use them to tell a story or paint a picture of a place with a few images. 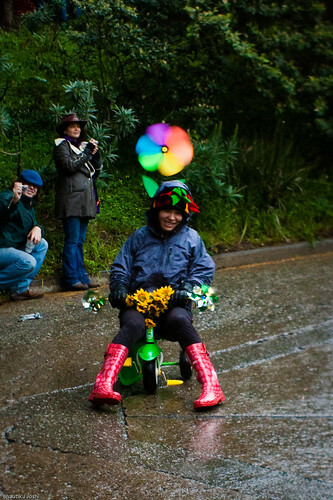 In all of these shots I've cropped the images to squares, and then used a circle mask to get a clean circular crop around the edges of the pictures. Go nuts with it, and get in close - I don't think you'll be disappointed :) You can find other fisheye tin-cam photos on flickr here. *I keep this site free-as-in-beer, but shopping on the photojojo site via this link contributes in a small way to my needless-optics-gear-fund and makes for a very happy photo nerd. 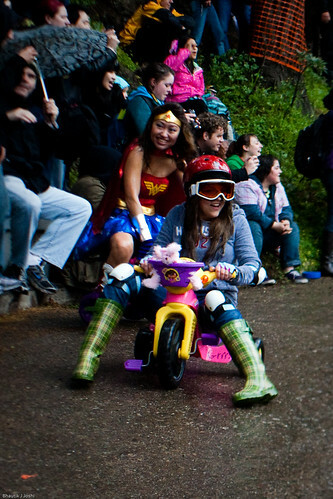 Full set here and the photo roundup from Caliber here. 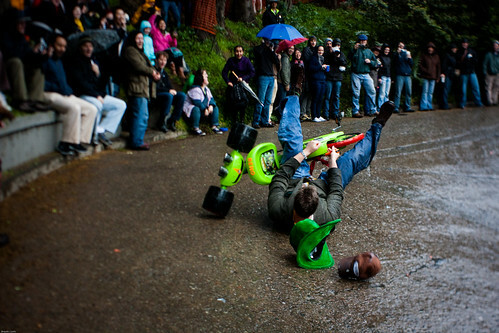 The 10th annual Bring Your Own Big Wheel (BYOBW) in San Francisco.